The CAS challenge this week is a fun color challenge. At first my thought was to do flowers as the colors really say flowers to me but them I wanted to do something a little different. I haven’t played with my Gorgeous Grunge set in a while and thought it would be fun to make a ‘celebrate’ card. After I finished the stamping…it just needed a little more so the best thing to spice things up is a little ‘bling’ so the bling swirls just sort of happened! Whisper White – 3 3/4 x 5. Stamp the larger splatter using Crisp Cantaloupe and So Saffron. 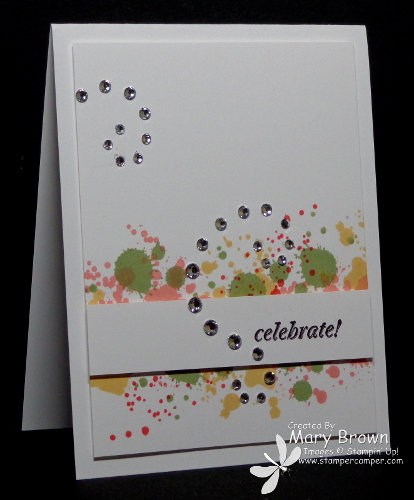 Stamp the smaller slapper using Pear Pizzazz and the very small splatter with Calypso Coral. Add Basic Rhinestone for lots of BLING! We have just started week 4 of Create with Connie and Mary Summer Edition 2104! This collection features products from the NEW CATALOG…you don’t want to miss it! If you are looking for some great ideas for the items in the NEW CATALOG, then this collection is for you! This entry was posted in Challenge, Clean and Simple (CAS) and tagged And Many More, Gorgeous Grunge. Bookmark the permalink.